There's lots of action right now in the compact system camera (CSC) segment, which pairs compact camera bodies with interchangeable lenses for a DSLR-like experience without the internal mirror or associated bulk. It's an area where Samsung has been making steady headway with an expanding range of lenses that now includes a new 45mm prime lens for shooting 3D stills and movies. It works exclusively with the latest arrival - the faux leather-clad Samsung NX300. 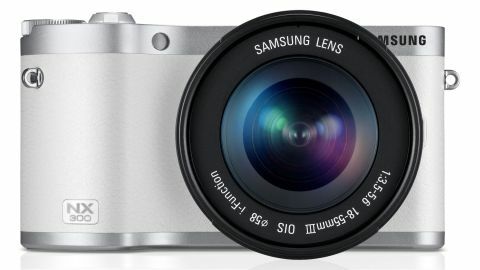 Retro credentials aside, this camera bears more than a passing resemblance to its siblings, the Samsung NX210 and Samsung NX1000, which currently remain on sale. There are similarities elsewhere, too, with each model - and the more traditional Samsung NX20, which is the only one to feature an integrated electronic viewfinder - sporting a 20.3 megapixel APS-C sized sensor. In the Samsung NX300, though, it's a brand new chip, with combined contrast and phase detection autofocus, which Samsung claims can fix on your subject in 0.08 seconds. That's impossible for us to verify in the lab, but it was certainly fast out in the field, and up to the job of fixing on a speeding rally car. It also now sports a maximum shutter speed of 1/6000 second, which is faster than last year's Samsung NX210's 1/4000 second speed, as well as raw shooting and an articulated touchscreen. In all, there are 105 phase detection and 247 contrast focus points on the Samsung NX300's sensor, and it can detect up to 10 faces to determine the correct settings for shooting group portraits. The Samsung NX300 is priced at £599.99 / US$748 (around AU$877), making it the same price as the Samsung NX1000 when it came out, and considerably cheaper than the Samsung NX210 and Samsung NX20's original full prices. It's in the same price bracket as rival CSCs the Olympus PEN Lite E-PL5 and Nikon 1 J2, but more expensive than the Sony NEX-5R and Pentax Q10. What you get for your money depends very much on which option you go for, since Samsung has put together two bundles - one with a traditional 18-55mm iFunction lens (equivalent to a 27.7-84.7mm range in 35mm terms) and one with a slightly shorter 20-50mm lens (30.8-77mm equivalent). We used the former in our tests. On each unit, maximum aperture stands at f/3.5 and f/5.6 at either end of the zoom, narrowing to a minimum f/22. The regular auto, scene and P,A,S,M modes are supplemented by a new arrival: Lens Priority. Pros will recognise this as a simpler rebranded aperture priority, which enables enthusiasts to forget all about f-stops and work with a simple defocus/sharpen slider, which you can drag on the touchscreen or move by twisting the focus ring on an iFunction lens. There's a flash in the box, but it's not integrated, so you'll have to either carry it about with you or fall back to longer exposures or higher sensitivities. Sensitivity kicks off at ISO 100 and runs through to ISO 25600, with three stops of compensation in each direction, in 1/3EV steps. In the Samsung NX210 and Samsung NX1000, sensitivity was capped at ISO 12800, so this is an improvement. The Samsung NX300 boasts 14 scene modes, with the usual suspects - landscape, macro, panorama and so on - supplemented by more creative options for blurring moving water and shooting streaking headlights at night. There's no dedicated movie mode, which in our book is a plus. You can shoot movies in any regular stills mode and won't risk missing a one-time shot the next time you switch back on because you've left it set to the wrong mode. Best quality footage hits 60fps at 1920 x 1080, unless you've opted for the 3D lens, in which case it's halved to 30fps. If that's a bit rich for your needs you can trim the resolution as far as 320 x 240, and the frame rate to 24fps.